For more food and food accessories, head over to my food blog, EdEats.com! I was really glad to be heading to EAT! Vancouver this year. I’ve been wanting to go for a few years now but always happen to be out of town when it happens. I think I first heard about it in 2006 but at the end of May, I was already heading to Europe with some friends for our backpacking/World Cup trip. Actually, I almost missed it again this year but arrived back in Vancouver in time on Friday to make it there on Saturday. In case you have no idea what I’m on about, EAT! Vancouver is a big, three day food and cooking festival at BC Place in Vancouver. There’s all kinds of restaurants, wineries, food manufacturers, retailers, farmers, and other gastronomically related businesses exhibiting their wares on the show floor. There were butchers and bakers but no, no candlestick makers. There’s over 250 booths, some of which have stuff for you to sample for free and others where there’s a small charge for a snack-sized portion of their specialty. I was starving by the time I got there on Saturday so I went straight for the restaurant booths. Most of the booths at EAT! require you to buy tickets (probably so they don’t have to deal with giving change and can work more efficiently on serving food to thousands of people) which are $10 for 20. Most of the booths charge between 2 and 8 tickets per dish, which means each is about $1-4. Win 2 Tickets to EAT! Vancouver! I missed last year’s EAT! Vancouver because of the Canucks Stanley Cup run. 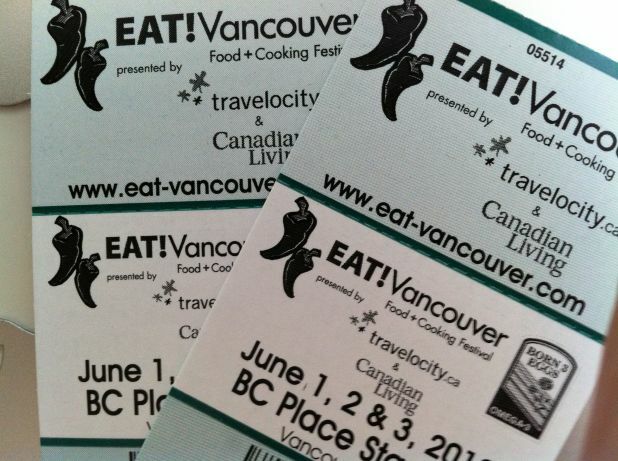 Actually, I almost missed it again this year because I come back to Vancouver on June 1st but luckily EAT!, one of Vancouver’s largest food festivals runs from June 1st through 3rd. If you’re a fan of all things edible like the 30,000 people that went last year, then I recommend you check this thing out since there will be a ton of local restaurants, bakeries, wineries, etc with booths, which means you’ll get to try some of the best Vancouver has to offer. Check out their website if you want more info on exhibits, competitions, and what Food Network personalities will be there. I’ve got two tickets to give away. Of course, you have to be in Vancouver during this time to win. Sorry, the tickets do not include airfare from wherever you are to EAT! Vancouver…they just get you in the door at BC Place. I don’t like difficult contests so I made this one obscenely easy. To enter to win two tickets to EAT! Vancouver, all you need to do is click a couple of blue buttons. 1. Like EAT! Vancouver’s on Facebook. 2. Like EdEats.com on Facebook. That’s it! Mightt take 20 seconds or so…more if you actually need to log into Facebook. Since most of you are at work, I assume you’re already logged into Facebook and then, that makes this even easier. Good luck! Draw will be on May 26th, probably at Dot Com Pho! Hope to see you there (I’ll probably be going on the 2nd.). I know, right? I’m probably one of the last people you’d expect to be at an expo about things like sustainability, eco-friendliness, and being green considering my love for combustion engines and penchant for eating animals that are inching closer to that endangered species list. But that’s the way the world is changing. It’s silly to assume we can just use and use the world’s natural resources at the rate we’re going and expect them to last forever. As much as I love bluefin, even I have to admit that we need to find new ways to produce fish or we won’t have any more otoro. I love the noise of exploding gasses but with gas at $1.46 a liter, I might have to find myself something electric…or hope that hydrogen power is coming soon. I could always use some more education on topics like this so I was excited to see what was being shown at EPIC this year. I can’t get into everything but here’s some of the things that interested me at the expo. I was invited to come by my friends at Whole Foods, who entertained and fed the crowds at the Epicurian Stage. Chefs Derek Sarno and Matt Talavera were serving up healthy meals with ingredients that both taste good and are good for you. You can see them tossing some kale to accompany the pork chops on the grill. Kale is amazing for you but can taste quite harsh and…chlorophyll-y? But cooked and seasoned right, it can be pretty darn delicious…or about as delicious as something good for you is going to get. Whole Foods was also talking about their 5-step Animal Welfare Rating, which is their way of helping improve the lives of farm animals as well as educating people on where their food comes from. They had the actual farmers producing their meat at the expo talking about how things work on a daily basis. I think it’s important to learn about the origins of your food, especially meat not only for your health but knowing gives you a greater appreciation for what goes on your plate. For more information, check out the Whole Foods website here. Sticking with food, one of the products on the floor has actually interested me for awhile but I was excited to try it out in person. SodaStream takes your ordinary water and carbonates it. That means you can make your own fizzy drinks at home at a fraction of the cost and with lower calories, sugar, etc. They say that sparkling water costs about 25 cents a liter with the machine. In comparison, you’re probably paying a bit less than $2 for a 2-liter of club soda at the supermarket. I tried the cola and mango flavors, which weren’t bad. The cola was a step above Diet Coke but since it’s made with a sugar substitute rather than cane sugar or high fructose corn syrup, it still has that chemical aftertaste. They don’t use aspartame, mind you, but currently anything that isn’t sugar doesn’t taste like sugar to anyone with discerning tastebuds. The day someone invents a zero calorie sugar substitute that tastes like freakin’ sugar and doesn’t cause cancer, that person is going to be rich. Like Oprah-rich. It’s a great idea but I hate chemical sugar taste more than anything so I’ll need a drink mix with cane sugar or something. Sustainability isn’t all about food. A lot of the exhibits were demonstrating green ways to decorate or renovate your home, including the outdoors. There were several patio sets and even some really cool sheds…yes, sheds but the thing that caught my eye was this wacky sphere gazebo from DeckPods. Seriously, doesn’t that look cool as hell? It’s quite a cool design. Unfortunately, their website isn’t…finished and there isn’t much info on the DeckPod available. It would be nice to know how much these things cost. There were several booths showing off bikes, since there’s no more eco-friendly method of transportation than being human powered…and not like in The Matrix. These, made by Stromer, are electric and modular. They come in several different models that vary by top speed, torque and range. While really cool, I can’t really justify something like this at this price (all three models shown were roughly $4,000) when regular gas-powered scooters are much cheaper, go faster and cost $5 to fill up. Like the problem with all electric vehicles, they become useless when they need a charge and can’t until they’ve been juiced. Of course, these just become regular bicycles but with a scooter, I can just pull into a gas station and it’s ready for another 500 klicks. These are, however, some of the most polished products when it comes to e-bikes as I’ve seen. They just need to be cheaper. Speaking of expensive electric vehicles, the Fisker Karma was in attendance. One of the only hybrid sports cars available today, the Karma pairs an rechargeable battery-powered 161-hp electric motor with a turbocharged 2.0-liter 260-hp gas engine. They start at $102,000US and for that price, you get a 0-60 of 6.3 seconds and a top speed of 125MPH. Any way you look at it…that’s slow. Well, maybe not slow but for that price, it’s slow. Consider that the Nissan GT-R is about ten grand less and will do 200MPH. Yes, it’s a hybrid but what’s the point of a hybrid sports car? You can never go fast in them since they’ll drain the battery quicker (the full range with a fully charged battery AND a full tank of gas is 370 km…which is less than my Mazda 3 on a full tank.). Maybe it’s a bit greener than a GT-R but electricity isn’t made from the meows of kittens. It has to be produced somewhere…plus making that battery probably took some work, rare materials and energy costs that exceed that of manufacturing a regular car. Get an electric car if you’re commuting to work or something but c’mon, if you’re going to spend $100k, get a real car. You’ll have more fun, save some money and the carbon footprint savings aren’t as significant as hybrid promoters would have you think. It’s quite a good looking car, though, which is more than I can say for most hybrids. I don’t know if there was a particular reason for this but I thought the VW van converted into an ATM was cool. There was a lot of clothing and apparel at the show as well but most of it was for women, apart from a table of cool graphic tees from a clothing brand called ThinkHead. I caught a couple of the fashion shows as well, showing off some local designers using sustainable materials. I found a few booths at EPIC with healthy or organic or fair trade alternatives to things I usually buy that I might try out soon but I think I’ll make those orders and try the products at home before I write about them but they all had something in common: they replaced something that exists already with a superior product that was either the same price or not much more. That made me realize something. That basically sums up the extent to which I’m willing to “go green” at this time. The problem with so many eco-friendly, carbon neutral or fair trade products is that they cost so much more than the original recipe OR they aren’t as good as the regular product. I saw a lot of booths featuring products I saw on CBC’s Dragon’s Den, most of which were rejected for the above reasons and that’s what I think is preventing a lot of people from getting on the eco-powered bandwagon. I understand that the more people that take part, the further down the prices go but still, it’s difficult in this financial climate to convince someone to choose a green alternative that costs twice as much and isn’t quite as good a product over something made by big bad corporate America. Awareness is great and all but when it comes down to it, most of us are more concerned about the bottom line. I’m not trying to discourage, I’m just telling it like it is. Honestly, I don’t know what the solution is but identifying the problem is the first step.